Mexico’s embarrasing seven-nil defeat to Chile led to many fans of El Tri questioning how such a disaster could have taken place. Was manager Juan Carlos Osorio to blame for poor tactics and team selections? Was it the fault of the players who lacked passion and quality on the day? Or did it prove that Mexico are simply not a great international team? 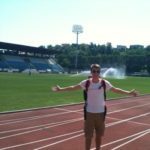 A history of last-16 defeats in the World Cup and early exits in the Copa América would suggest that, although Mexico are a good national team, they haven’t become a great one yet. 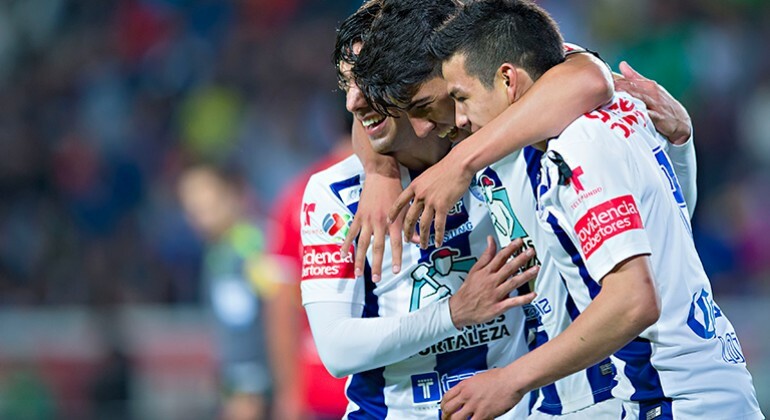 There are plenty of reasons why Mexico haven’t become a global power, but one reason comes up time and time again, a percieved lack of playing time for young Mexicans in Liga MX. This issue has become increasingly debated in recent years due to the rise in usage of naturalized players, and the introduction of the 10/8 rule for the upcoming Liga MX campaign. Fans often complain that young Mexicans don’t get enough opportunities, but as of yet I haven’t seen any statistical evidence showing that less young nationals receive first team football in Liga MX when compared to other major football divisions around the world. This study aims to find out whether what fans perceive as a lack of playing time for youngsters is true in reality. Liga MX is compared to perhaps the five biggest leagues in the world; Italian Serie A, German Bundesliga, English Premier League, Spanish La Liga and French Ligue 1. As well as having huge domestic leagues, these nations have all had plenty of international success, winning ten World Cup’s between them. The graphic below shows opportunties given to Under-23 nationals (at the time of research) during the 2015/16 season. The term ‘nationals’ refers to players from the same country as the division they play in. Note that dual-nationals are included in the study as long as they haven’t been tied to a different international team through playing in a competitive match. The table includes three columns; teams per league, players per team, which tells you the average number of U-23 nationals each team played in the league last season, and minutes per match, which shows on average how many minutes U-23 nationals would receive in a given match. Minutes per match was chosen as it removes any bias created by the difference in number of matches between the divisions. Looking at the player per team column first, Liga MX actually performs quite well in comparison to the other leagues in this study. On average Liga MX teams used 5.5 under-23 nationals during the 15/16 season, second only to Ligue 1. The other leagues lag a fair bit behind, particularly Serie A, whose clubs used just 2.7 U-23 nationals on average. Players per team isn’t the best guide to find out which leagues gave the most opportunities to young nationals last season though, as it doesn’t take into account how much football the youngsters received. Minutes per match gives a better idea. 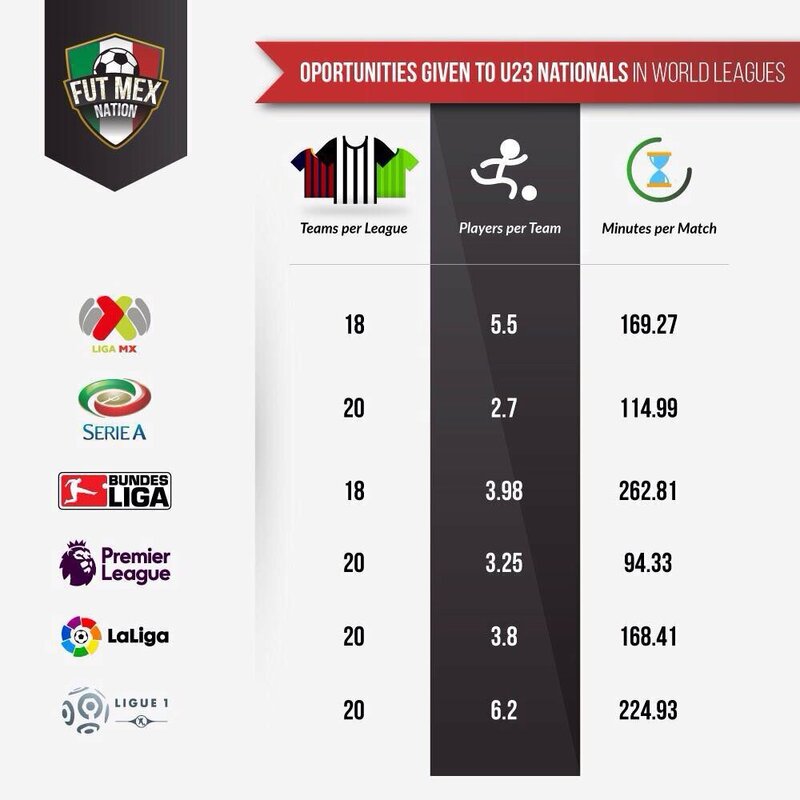 Liga MX doesn’t perform as well on minutes per match, placing third behind the Bundesliga and Ligue 1, and just ahead of La Liga, with U-23 Mexicans getting 169.27 minutes per game. This equates to, on average, one U-23 Mexican playing the full 90 minutes, and another being subbed off with around 10 minutes to go. With Liga MX ranking lower in minutes per match than in players per team, it suggests that many of the young Mexicans in Liga MX that are receiving some first team football aren’t receiving much when compared to other major divisions. Liga MX is still third out of six on the list though, and is far ahead of Serie A and the Premier League. Therefore, it would seem that there isn’t a major problem with the amount of minutes young Mexicans receive. Also, this study only takes into account league football, and many young Mexicans get plenty of opportunities during Copa MX due to its group stage format and lack of prestige. However, it must be noted that a huge portion of the opportunities for young Mexicans are given by just two Liga MX clubs; Chivas and Pachuca. Strong evidence for this is found in my previous young players study, which assessed which Liga MX teams give the most chances to young Mexicans. This study does have a few limitations. Perhaps most significant is the differences in standards of play between the divisions. Whilst Liga MX is a strong league, it would be difficult to argue that the standard of play isn’t inferior to the other leagues in this study. The study also doesn’t include young players that play abroad. Therefore, for example, some of France’s top talents; like Anthony Martial, Kingsley Coman, Kurt Zouma and Aymeric Laporte don’t contribute to Ligue 1’s data. It’s also important to remember that this data is taken from just one season, and the results may vary depending on which season you choose to look at. Perhaps the main take from this study is that foreign player restrictions aren’t needed to make sure young players get plenty of league football. As members of the European Union, clubs in Italy, Germany, England (although this may change post-brexit), Spain and France can sign and play as many EU nationals as they like. Furthermore, the Bundesliga, which leads the minutes per match column, has no restrictions on non-EU nationals. Overall, this study has limitations, but the results suggest that a lack of first team football for young Mexicans isn’t a major problem. Certainly, on last season’s evidence it doesn’t compare badly to other major global leagues. However, a wider study, which looks at more leagues over a longer period of time would have to be done to fully determine whether or not young Mexicans don’t get many opportunities when compared to other countries. If you have any thoughts on this study, let me know on twitter. You can find me @tomh_36.